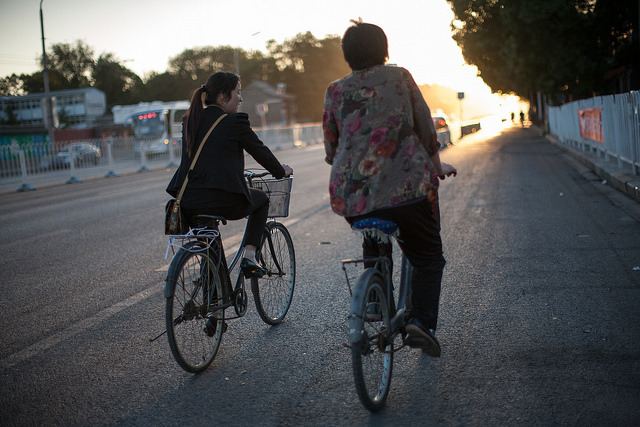 Bikes, downtown Beijing. Photo by Benoit Colin/WRI. On Sunday, December 6 the Partnership on Sustainable, Low Carbon Transport (SLoCaT Partnership), together with Bridging the Gap Initiative (BtG Initiative), and the Michelin Challenge Bibendum (MCB) hosts Transport Day 2015. This is the main event of the Paris Process on Mobility and Climate (PPMC) platform, which aims to bring together transport experts from around the world to meet and discuss the important contributions that “sustainable mobility can make to the mitigation of, and adaptation to climate change”. The first week of COP 21 featured several other transport-focused events, including Lima-Paris Action Agenda (LPAA) Transport Event and Cities and Local Governments Day: Pathways to Sustainable Mobility through Local, National, and Global Action. At the LPAA Transport event, eight of the world’s largest multilateral development banks (MBDs) pledged to ramp up their existing financing commitment for low carbon transport solutions. The MDBs reinforced that they will continue with their previous commitment to providing $175 billion of financing by 2022 for transport projects that aim to mitigate emissions and increase resilience to climate change. Events such as these continue to emphasize the urgency to mitigate emissions and increase resilience in the transport sector—whose emissions are growing faster than any other sector. While sectors like land transport are not subject to the negotiations, a global agreement will certainly trigger speeding up slow carbon action in the countries. However, It will be up to national governments, non-governmental actors and the private sector to come together to push for more action in the transport sector. These actors and decision makers within the sustainable transport community must create joint ventures with governments and businesses to better position the transport sector within mitigation and adaptation efforts. There is growing recognition that the transport sector needs to be part of the discussion at COP21. It is crucial that the climate change negotiations acknowledge the importance of sector contribution and the need for action through the intended nationally determined contributions (INDCs). As of November 12, 2015, 133 INDCs representing 160 countries were submitted. Of these, more than 61 percent explicitly proposed actions to mitigate emissions from the transport sector. However, few provided overall goals; only 10 percent of the INDCs included an emissions reduction target for transport. More troublingly, analysis shows that the current mitigation commitments proposed in the INDCs will not achieve a 2-degree Celsius scenario. It is apparent that more needs to be done by countries to significantly reduce their emissions. In addition to the INDCs, there are transport initiatives that have their own ambitious commitments presented in Paris. It is not clear, however, if these commitments are acknowledged in INDCs. It is also unclear if the initiatives have the capacity to execute the commitments. This is why after Paris, the commitments need to evolve into detailed actions. Through coordinated efforts between new collaborative initiatives (e.g. Compact of Mayors, Cities Climate Finance Leadership Alliance) the private sector, NGOs and governments, INDCs are likely to aid national governments in achieving the requirements for emissions mitigation and adaptation. Emitting 23 percent of global emissions, the transport sector has traditionally been framed as a problem for global climate actors. However, sustainable transport provides a unique opportunity to significantly decrease global emissions—while simultaneously benefitting users. Take for example, Guangzhou’s BRT system in China that saved 86,000 tons of CO2 emissions annually in a decade from its introduction in 2010 with operational savings of $14 million annually from higher bus speeds and fewer bus kilometers, while keeping it affordable for more than 300,000 low income residents along the corridor. National governments and cities should realize that sustainable transport can both benefit the environment and offer co-benefits, such as savings for governments and improved health and quality of life for citizens. After Paris, transport – like other sectors – not only needs to be included in INDCs, but need to lead to a detailed action plan that enables a true low carbon pathway for the sector. Furthermore, the international community should be ready to incentivize and support a national focus on a long-term-structuring sector such as transport because these actions will be critical to meet the growing demand for urban transport, since 60 percent of the world’s population is expected to live in cities by 2030. Promises at COP 21 should also be aligned and provide synergy with the UN Sustainable Development Goals (SDGs). And to scale up efforts, the national commitments being forged at COP 21 and major transport initiatives commitments need to be brought and expanded upon at upcoming platforms, such as Habitat III. The conference, which could lead to new governmental commitments towards national finance, regulation and institutional support for the growing urban transport challenges could be an important milestone. To shape a comprehensive climate policy in the years to come, the transport sector must be empowered at all levels – global, regional, national and local. Without this renewed focus, emissions from the transport sector will only continue to accelerate. Maintaining this type of momentum from Paris, key stakeholders must continue their commitments to take action to address climate change in the transport sector.